Smart Manufacturing envisions a future where factory equipment can make autonomous decisions based on what’s happening on the factory floor. Businesses can more easily integrate all steps of the manufacturing process including design, manufacturing, supply chain and operation. This facilitates greater flexibility and reactivity when participating in competitive markets. Enabling this vision requires a combination of related technologies such as IoT, AI/machine learning, and Edge Computing. In this article, we will introduce Edge Computing and discuss its role in enabling Smart Manufacturing. Put simply, Edge Computing is about taking code that runs in the cloud and running it on local devices or close to it. Like in a gateway device or a PC sitting next to the device. Things like IoT devices, which generate sensor data. Insights you extract from this data. Actions you perform based on these insights to deliver some sort of value. With Edge Computing, you move the insights and actions components from the cloud to the device. In other words, you bring some of the code used to process and extract insights from the data, and perform some action in response to it right into the device. You may still want to send data to the cloud for further processing and actions, but now you have the option of balancing your workloads more efficiently based on latency, compute power, or data privacy requirements. Notably, one of the things we can move to the edge is machine learning and AI algorithms. When we do this, we say that we have an intelligent edge. When is Edge Computing useful? Mission-critical scenarios where you need real-time insights for quick decision making. Basically, when the electrons cannot travel fast enough to the cloud and back, to do what you need to do. Think about an autonomous vehicle approaching a red light. It can’t afford the second delay to route the message to the cloud and wait for a command back. When the car sees a red light, it needs to perform analytics in a closed loop and stop immediately. Increasingly, these insights are being provided by machine learning models running on the device, performing predictive analytics, anomaly detection, image recognition, and classification. Remote sites where cloud connectivity is not stable or economical. 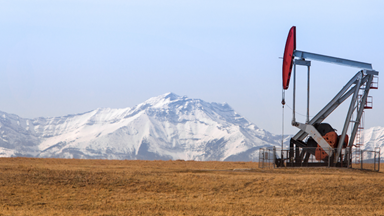 For example, remote oil fields send data to the cloud only twice a day via satellite connection. Geographies where compliance and data residency are critical. You can pre-process sensitive data locally within a sovereign or organizational boundary. Avoiding transferring terabytes of raw data between devices and the cloud to reduce bandwidth costs. You can perform data cleaning and aggregation locally. How does Edge Computing compare to private cloud? Private cloud is essentially a model of cloud where IT services are provisioned over private infrastructure for the dedicated use of the organization. Private cloud is best suited where you have cloud applications or application components that need to be deployed on-premises to overcome latency, connectivity, or regulatory requirements like when you need to isolate your environment from the public cloud. Edge Computing, on the other hand, is about running computations on the device, and communicating to the cloud when needed. Now, the cloud these devices communicate with can be the public or private cloud. The device doesn’t really care. Edge and private cloud can be operating in the same environment. A good example would be a cruise ship where passenger services and navigation apps would run on the private cloud, and engine maintenance would run on the edge. Now, to make things more interesting, there is also the option of running a hybrid cloud. Which is a combination of private and public. In fact, many companies run their cloud environments this way because it gives them the best of both worlds. The latency and privacy of the private cloud, with the scalability and economies of scale of the public cloud. So, as you can imagine, you can have scenarios where you are running a hybrid cloud environment, with some things running in the public cloud and some things running in the private cloud. In addition, your IoT devices are running Edge Computing with some things running on the devices and some things running on the cloud. How does Edge Computing enable Smart Manufacturing? The smart part of smart factory is about autonomy. The ability of some asset or piece of equipment to make decisions based on what’s going on in the factory floor without the need of human intervention, these are decisions that are not necessarily pre-programmed in some factory control system. The aim of Smart Manufacturing is to utilize a more programmatic data-led approach to develop new and higher quality goods faster. Edge Computing can enable this autonomy where machines in the factory floor extract insight and formulate actions at near real-time. Running AI/machine learning algorithms in their own electronics, almost as if they had their own brains! Consider this example where you have two robots that are performing some task. The robots are connected to an edge device that is running a machine learning model listening to sensor data from the robots and whose mission is to predict an impending failure. When the machine learning model determines that one of the robots is about to fail, it triggers actions. These actions may include stopping or slowing down the line that feeds the robot in trouble, and/or triggering a process in the cloud to create a service request in some line-of-business application. What does Azure offer to enable Edge Computing? Azure IoT Edge modules are containers that run Azure services, 3rd party services, or your own code. They are deployed to IoT Edge devices and execute locally on those devices. 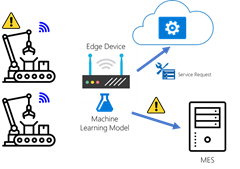 The Azure IoT Edge runtime runs on each IoT Edge device and manages the modules deployed to each device. An interesting fact is this runtime will be open sourced to the developer community so that they can make changes and additions to it. A cloud-based interface enables you to remotely monitor and manage IoT Edge devices. As with any new technology, our recommendation is to start small to quickly prove its value while limiting the risk to an acceptable level. Pick a business problem you want to solve, refer to the “When is Edge Computing useful?”section above for ideas and set up a team to work on it. Learn more about IoT Edge, including quick starts and tutorials to get you started.